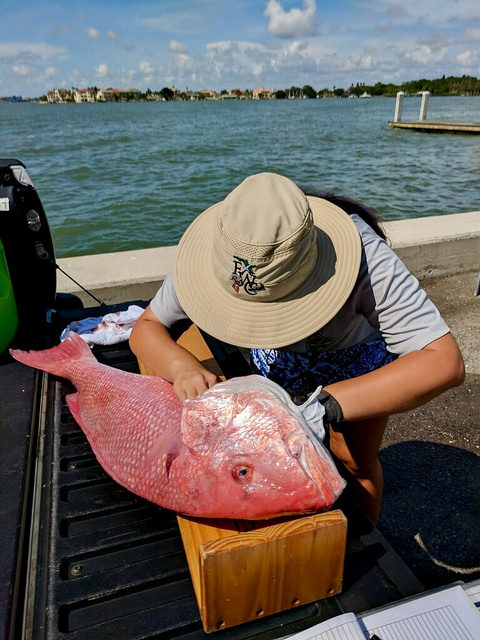 A biologist collects a sample from a red snapper caught by an angler that was interviewed for the Gulf Reef Fish Survey. Samples are used to determine the age of harvested fish. For residents and tourists alike, Florida looms large in the angler’s imagination. With over 1,300 miles of coastline, Florida is second only to Alaska in miles of shoreline. Our saltwater fisheries entice anglers from around the world with powerful tarpon, vibrant schools of snapper, grouper and more. Florida boasts the most active marine recreational fishery of any state in the country; in 2017, Florida anglers took more than an estimated 9 million recreational fishing trips from pleasure boats in the Gulf of Mexico. The economic impact on the state is significant, but careful management is key in the continued success and health of such an important fishery. Collecting data from such a large and diverse fishery is a complex and vital task, which led to the development of the Gulf Reef Fish Survey (GRFS) by FWC. The Gulf Reef Fish Survey is designed to meet current needs for more timely and precise data from recreational anglers. Beverly Sauls is a research scientist for FWRI and is the lead researcher who has been responsible for developing the Gulf Reef Fish Survey. 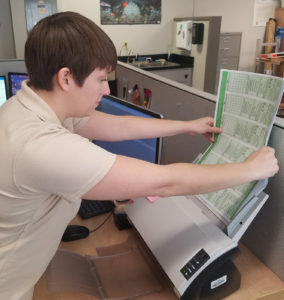 She notes that this new survey method has been pilot tested in Florida over the past four years and has run side-by-side with the existing Marine Recreational Information Program (MRIP). The MRIP is a general survey designed to monitor all types of saltwater recreational fishing across the eastern United States, and in Florida, the survey is conducted by FWC in partnership with the National Marine Fisheries Service. Since most recreational saltwater fishing trips take place close to shore, the MRIP survey provides a good measure of the numbers of fish that are harvested and released for many important inshore species in Florida, such as snook, red drum and spotted seatrout. However, trips that take place farther from shore are not encountered as frequently and catch estimates for reef fish are not as precise. Thus, the Gulf Reef Fish Survey was designed to complement the MRIP survey in Florida and collect more detailed data from reef fish trips. Since April 2015, recreational anglers who fish from private boats on the Gulf Coast of Florida have been required to sign up for the Gulf Reef Fish Survey to legally harvest red and vermilion snappers; gray triggerfish; gag, red and black grouper; greater amberjack and other amberjacks (lesser amberjack, almaco jack and banded rudderfish). Over 500,000 anglers are subscribed to the Gulf Reef Fish Survey, and by signing up an angler is eligible to be randomly selected to receive a questionnaire in the mail which asks about recent fishing activity. This specialized survey allows the FWC to collect detailed information on the areas where recreational anglers harvest and release reef fishes and precisely estimate the numbers of recreational fishing trips along the Gulf coast that target these species each month. Additionally, FWC biologists conduct dockside interviews with anglers as they return from recreational fishing to collect information on the numbers and types of fish landed and released, and these data are combined with catch data collected through the MRIP survey to increase the sample sizes. FWC biologists intercept anglers as they return from fishing trips to conduct interviews and collect samples from harvested reef fish. 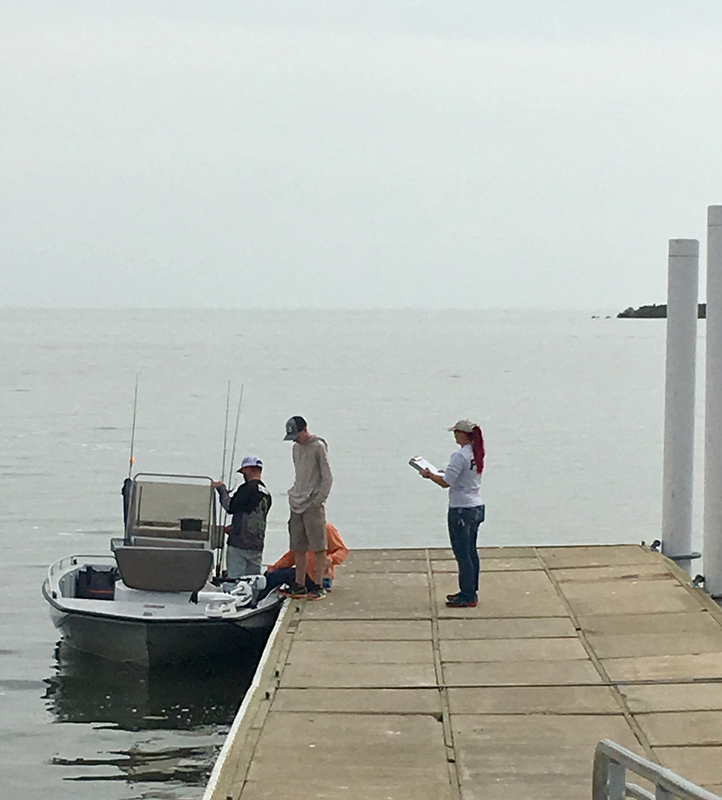 During dockside interviews for the Gulf Reef Fish Survey, information on the size, weight and age distribution of harvested fish are collected, which are important data needs for stock assessments. To date, over 3,500 harvested reef fishes have been sampled and over 4,000 fishing parties have been interviewed at the dock. The Gulf Reef Fish Survey is also providing new information on the usage of artificial reefs by recreational anglers, and the types of fish caught on artificial versus natural habitats. Before this study, there was no information on the level of recreational fishing that takes place on artificial reefs. Tiffanie Cross oversees the mail survey portion of Gulf Reef Fish Survey and is lead author of a peer-reviewed manuscript to be published this year, which found that 46 percent of angler trips that target reef fishes off the Gulf Coast of Florida utilize artificial reefs. Approximately two-thirds of all reef fish trips take place nearshore in state-managed waters (less than 10 miles from shore), and seventy percent of trips that utilize artificial reefs occur in this area. Regionally, the highest proportion of angler trips targeting reef fish on artificial reefs takes place in the panhandle of Florida, where red snapper is most abundant. The Gulf Reef Fish Survey was formally reviewed in 2018 by a team of statisticians from across the country that are experts in survey design. During the review, researchers from the Fish and Wildlife Research Institute presented details of the survey design, methods, procedures and results from pilot testing. In their final report to the FWC, the reviewers concluded that the approach taken to monitor recreational fishing in Florida is appropriate and that the methods are statistically sound. Each month, questionnaires are mailed to anglers signed up for the Gulf Reef Fish Survey. Questionnaires that are filled out and returned to FWC are scanned and used to estimate the number of fishing trips taken by reef fish anglers. The reviewers also provided valuable suggestions for ways for the FWC to improve the current survey. Their greatest concern was the low response rate for the mail survey. Currently, about 20 percent of anglers who receive a GRFS questionnaire in the mail return it to the FWC; compared to similar scientifically designed mail surveys that obtain response rates as high as 30-40%. One possible explanation is that more than half of new survey subscribers report to the FWC they are unlikely to fish for reef fish in the Gulf and may not need to be signed up for the survey. To address this, the reviewers suggested ways to ensure that when anglers purchase a saltwater fishing license and sign up for the survey, they are properly informed about the survey and whether it applies to the type of fishing they do. Another recommendation was to provide an option for anglers to respond to the survey online. Much of the funding for pilot testing the Gulf Reef Fish Survey is a result of settlements following the Deepwater Horizon oil spill, through the National Fish and Wildlife Federation and Gulf Environmental Benefit Fund. The project’s current funding is slated to end December 2020, although the survey has become an important data source for managing recreational fisheries in Florida and FWC is exploring ways to continue funding the project over the long term. The GRFS is conducted by the Fisheries Dependent Monitoring Program, which is part of the FWRI Marine Fisheries Research Program. Other FWC programs involved with this project include the Division of Marine Fisheries Management and the Office of Licensing and Permitting. The survey would not be a success without the support and feedback from recreational anglers across the state of Florida, as well as visiting anglers who also fish our waters. This year, the state of Florida is requesting formal certification of the Gulf Reef Fish Survey as a statistically valid source of data for use by federal scientists in regional stock assessments and fisheries management. By participating in the Gulf Reef Fish Survey, you are making an important contribution for the continued conservation of Florida’s world-class fisheries.